Have you ever looked closely at the cream in a cup of coffee? 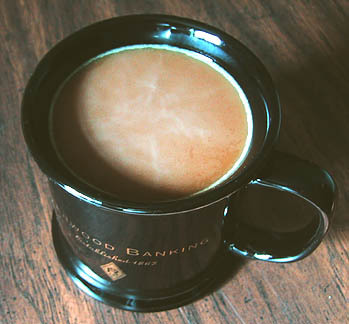 If you don't keep the liquid well stirred, the lighter cream may separate from the darker beverage. When we were freshman physics majors at Oberlin College, my friend Jan Olson became curious about the phenomenon. Like any good scientist, she decided to collect some experimental data. Having no access to photographs like these, she went home for Christmas vacation. 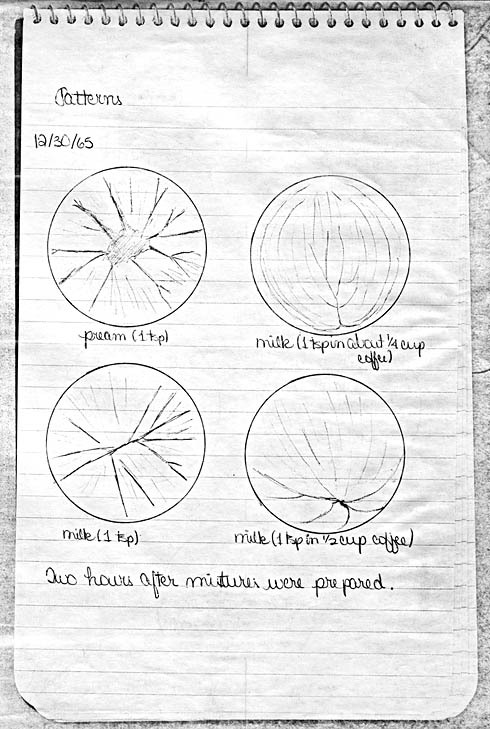 She prepared several cups of coffee, let them sit, and then sketched the patterns that developed. Later she showed me her notebook, and I copied this page. But what was really going on? There were no theories, no conclusions. The quoted researcher was not Jan Olson but rather geophysicist Peter Olson (no relation). 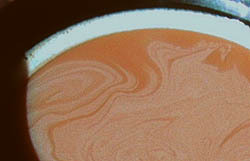 He drew parallels between coffee cup convection and movement in the interior of the Earth. Although the article lacked illustrations of any kind, the coincidence was sufficiently striking to inspire me to forward the magazine to my college classmate. I also enclosed the following note, in which I endeavored to achieve rhymingness. Fascination with patterns you find in your coffee. With your sketches and words  but without photogroffy! In my kitchen there's no coffeemaker electrical. With no first-hand experience, I remain skeptrical. Gaze then at all of your mugs, cups, and glasses! From swirlings deduce what goes on in Earth's mantle! 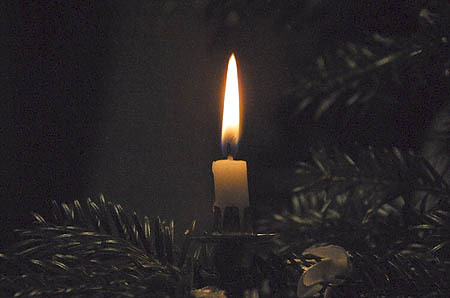 And light up the room with a bright Christmas cantle.